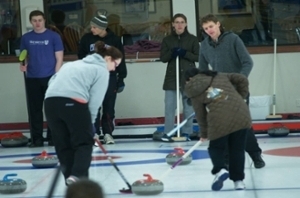 Are you looking to get involved in the popular winter sport of curling? 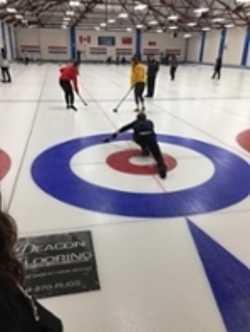 Western’s Mixed Curling Club is a social club that provides members of all skill levels the opportunity to meet new friends in a relaxed atmosphere. Our recreational club includes beginners, skilled curlers, and everyone else in between. We encourage anyone interested to come and join us for a free curling clinic before the season starts to either learn how to curl, or as a refresher. Equipment is provided, all you need to bring are clean sneakers. See you out on the ice! I currently also participate in the Thompson Mixed League on Tuesday nights. On campus, you can often find me doing work in the Social Science Centre during the day or at Western Rec most nights. I plan on continuing to curl for as long as I have the time and physical ability to do so! Alicia: My name is Alicia Simbirski, I am in 3rd year Rehabilitation Science Health Studies and I have been curling for 11 years now. I have been curling with the Western Curling Sports Club for 3 years now and it’s a great way to meet new people. Everyone apart of the club is super friendly, which makes for a relaxing, fun environment. In my pass time I enjoy participating in and watching sports events including curling and hockey. 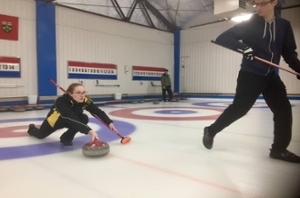 Learn to Curl Clinic: WMCC ran a free learn-to-curl clinic in the fall of 2018 for new curlers to try out the sport for free. We have learned that there is a large interest base for curling but also understand that curling is a big financial investment. 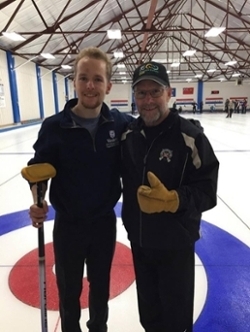 This event introduced new people to curling through a fun day with Canadian curling pro Tim Lindsay, who previously represented Northern Ontario in the Tim Horton’s Brier. Annual Opening/Closing Dinners: Each year, during our first and last practices we hold dinners following our practice. This is usually catered by a professional catering company in London and features delicious restaurant meals. There are often prize giveaways during the last sessions of both terms as well. Sport Club practices for Fall 2018 begin on Sunday Sept. 23 and will conclude on Saturday Dec. 1, 2018. Practices for Winter 2019 term resume on Monday Jan. 7 and conclude on Sunday March 31, 2019.